Many of us are familiar with the photographs of Marilyn Monroe entertaining American troops during the Korean War; however the tradition of providing troop entertainment to boost morale has roots in the First World War. The area behind the front lines on the Western Front was in some ways like a city stretching from the English Channel to the Alps. Thousands of soldiers rested, trained and worked behind the line of fire, by the last years of the war soldiers could send mail, get a haircut, go to church and even vote without ever leaving the combat zone. Troop entertainment became popular largely after 1916, and groups would travel the lines with their costumes and pianos in tow, entertaining soldiers during their rest periods. The most famous Canadian group is without a doubt the Dumbells, begun around 1917 by two brothers, Merton and Al Plunkett. As an employee of the YMCA, Captain Merton Plunkett originally began his show as part of the services offered by the group to frontline troops. He later suggested and gained permission for talented soldiers from the battalions of the CEF to be seconded to his new entertainment group, much like they would have been transferred to another battalion or sent on a course. The Dumbells joined some thirty other entertainment groups in the CEF, including the Princess Pats, who were attached to the PPCLI. Of these, only the Dumbells were allowed to remain together as a permanent group. 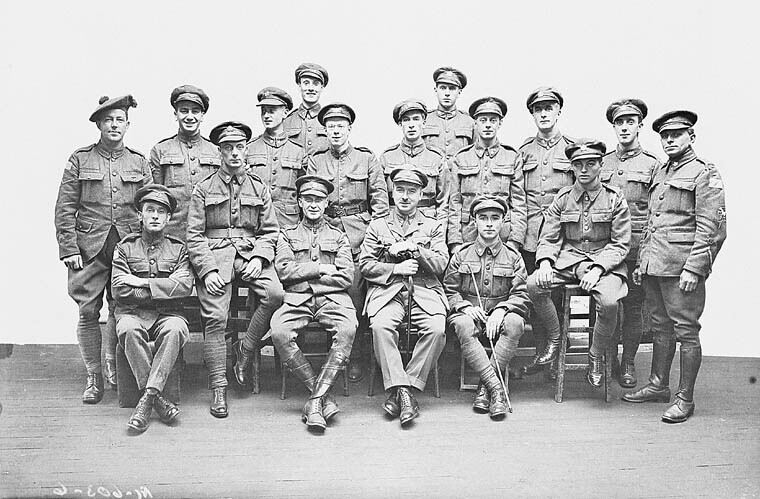 After being endorsed by both Lt-Hamilton Gault and Major-General Lipsett, the men seconded to the Dumbells were permitted to stay with the group indefinitely, and by 1918 they were performing not only to the troops on the front but those in the hospitals in France and finally in London as a vaudeville show. Their acts included satirical songs and skits depicting trench life, cross-dressing shows and renditions of popular soldiers’ tunes like “Girl from Armentières”. The Dumbells continued to travel after the war, and published several popular songs written by their members. The group broke up permanently in 1932 after severe financial difficulties. The tradition of the Dumbells is carried on today by the group Soldiers of Song, who continue to give performances of the songs and skits made popular by the group, and others, during the First World War.